Home > News > Beerfest > Meet Kiwi Native Michael Cowen of Manor Brewing Company. Inec Inec Meet Kiwi Native Michael Cowen of Manor Brewing Company. Manor Brewing Co. was founded on 5th December 2017, by Michael Cowan & Amaya Cully, when myself (Michael), led by Richard Hamilton, brewed our first ever batch in Kilbride Manor’s Bell Tower, which is now location of the Manor Brewery. Richard had been home brewing for 12 years up until that point, and has now moved on to Boyne Brewhouse full-time. Me, well, effectively I started brewing on that same day…and have never looked back! That first ever batch ended up winning a GOLD medal at the 2015 Dublin Craft Beer Cup! So, we had to launch that year before we were ready, and spent the next 2 years chasing our tail; to maximise the opportunity an international beer award gives a new brand. 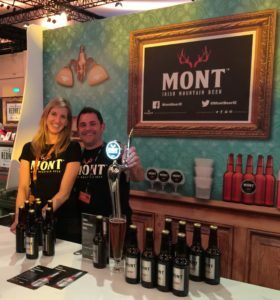 In 2015, we ‘Cuckoo-brewed’ our first commercial batches at Pokertree Brewing (NI), launching our flagship beer, MONT™ officially at the Irish Craft Beer Festival at the RDS that year, before switching to an interim brewing contract with Brú Brewery for one year, whilst we developed our own brewery plans at Kilbride Manor. Due to the inevitable delays in building a craft brewery, we required another year under a contract brewing arrangement, to ensure we continued to supply & grow MONT™. So, from Jan 2017 we have been brewing with Boyne Brewhouse, and Michael & Richard have been reunited in brewing the beer they created together, albeit temporarily. In 2018, we plan to open our 20HL state-of-the-art brewery in Kilbride Manor, and bring everything back under one (new) roof! In the meantime, MONT™ continues to grow. Our main beer, MONT™ Super-Premium Lager now comes in many formats; 300ml & 500ml bottles, 4 packs, 5L mini-kegs, and 30L Kegs. In January 2017, we also started brewing very small batch ‘craft brews with a twist, at the Manor Brewery, under our new ‘Manor Brewer Series’ range. So far we have release 2 beers (‘Tall Poppy Syndrome’ Belgian-style Dubbel, and a black lager infused with Valencia oranges called ‘Black is the new Orange’). At Killarney Beer Festival we will be launching our latest MBS beers ‘Triumph and Disaster IPA’ and the aptly named ‘Bigger than Ben Hur’ Imperial IPA at 9.2% and 181 IBUs! MONT Distinction Lager 5.1% – a GOLD medal winning debut! ‘Triumph and Disaster IPA’ and the aptly named ‘Bigger than Ben Hur’ Imperial IPA at 9.2% and 181 IBUs! We only brew beer styles we like. That’s a big range of choice though. I generally like Pilsners (obviously), Belgian ales, Stouts, and only technically beautiful IPAs. That must be our first Imperial IPA…we went to town on the hop bill, and really have no idea how it will taste when we launch it this month! Our black lager was fun too. We just used our MONT™ brew sheet, and just swapped out Bohemian Pilsner and Vienna malts for a single Chocolate Malt. It was a risk, but one that we were pleased with. That’s easy, a wild ferment Imperial MONT™ , double fermented (2nd one controlled), from an open FV in the upper floor of the Bell Tower in the brewery! Brewed mid-summer, slats open to attract the wild yeasts, and ‘cave’ the beer for 4 months for a Christmas Day release in a 750ml ‘cork & cage’ bottle! Boom! BBQ or Seafood…I’m a Kiwi, for god’s sake! It’s only limited by our imagination, a conservative trade, and the influx of imported foreign craft & world beers making Irish craft beers fight (unnecessarily, in my opinion) against team and each other for limited shelf space and bar taps. I think there’s 8-9 craft breweries in Ireland absolutely nailing it right now. I admire them all, and the tenacity of all other craft breweries trying to forge ahead make their visions a reality. I also love Dogfish Head (USA) for the brewery building & taproom alone, and hope the Irish Craft Drinks Bill (when it lands) will bring about the same marriage of great beer and great design in Ireland! Yes, very much so. We have new beers, a new Mont Bar, and a new look, so I’m looking forward to seeing how festival goers react. I’m also looking forward to catching up with all the other brewers and friends. Killarney is probably the most picturesque craft beer festival in the country! MONT™ is starting to be everywhere now, particularly in ‘Mont Country’ (South Leinster). Our Manor Brewer Series ‘limited edition’ beers can only be found on our Festival bar or (soon to be launched brewery Taproom. But be quick though, we only make a few kegs each!